Should I Drink My Urine? You are lost at sea for days now. You have nothing to do. No where to turn. Nobody to talk to. And you are now facing the effects of dehydration and starvation: scurvy, refeeding syndrome, hallucinations, fevers, etc. What should you do? As a matter of fact, what can you do? Some people argue that there is nothing to do but wait for the inevitable death that is soon to come, but others argue that you can utilize the very processes that we ignore on a day to day basis to survive during these times of need. Thus, some say that the use of the human digestive system can save your life! Now, you might be asking yourself, “What is he talking about?” Well, my fellow classmates, I am talking about drinking your own pee. It might be easy to knock the idea down since your are not in this position, and most likely never will be, but that does not mean that others who are less fortunate than you might not run into the same problems. As hunger and dehydration begin to dole out its consequences on the human body, drastic measures might have to be taken in order to survive another day. However, the important questions that need to be answered by the scientific community are as follows: How healthy is drinking one’s own urine? Are any adverse effects imposed on the human body by doing so? Is it recommendable if all other options are exhausted? According to an article regarding urine therapy (the practice of using urine for multiple positive effects on the human body), urine is made up of a number of nutritional elements that are actually helpful to the human body. As a matter of fact, Dr. A.H. Free’s research explained in that very article showed that the urine expelled from humans contains amino acids, a number of essential vitamins, minerals, hormones, enzymes, creatine, etc. This is because urine is actually just the excess from blood that is not needed; the body is constantly renewing its blood and cleaning it with the kidneys and liver, and any leftover is what eventually gets expelled as pee. More specifically speaking, approximately 95 percent of the pee humans expel is water, while the remaining 5 percent is nutrients and excess vitamins. Thus, urine is actually more sterile than distilled water! But, did you know that you can do more than just drink your own urine?! As a matter of fact, through something called urine therapy, you can use the urine that the human body expels for more than just drinking; it is effective against acne, allergies, cancer, psoriasis, wrinkles, etc. And urine can be injected, swallowed, lathered, used as eye drops and even ear drops! Bao Yafu is the older gentleman on the right. Like Andrew has explained in class, the power of anecdotes are extraordinary, especially in the scientific community, even if those anecdotes have no substantial scientific proof to support it. 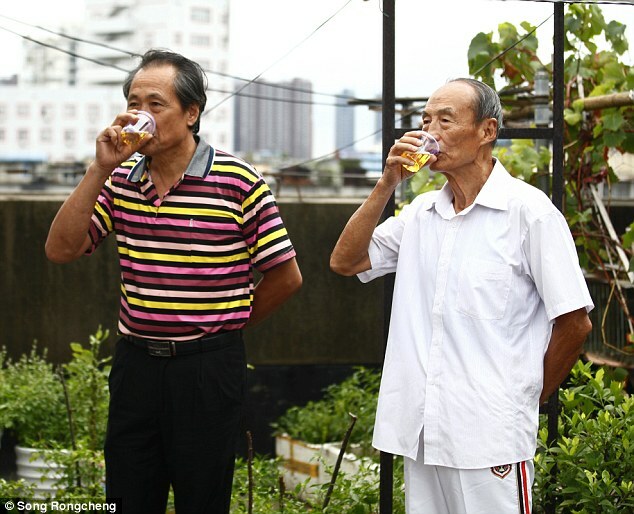 For example, both the Chinese men Bao Yafu and Yi Dongshan have been drinking their urine for decades, and more specifically, Bao Yafu has been doing so since the year 1972! Now, Mr. Yafu has been head of the China Urine Therapy Association, and organization that is dedicated to people who enjoy drinking their own effluent, since 2008. With nearly 1,000 members, this club has now been officially recognized by the Chinese Ministry of Health! Furthermore, Bao has a number of claims that he believes were only possible becasue of the practices he completes with his own urine samples; he says that the practice has eradicated his canker sores, cured his constipation, and even fixed his baldness! However, other than personal anecdotes and the science behind what actually comprises urine, there is no substantial evidence or research that proves that urine has positive effects on the human body; in other words, there have been no controlled studies that have proved the effectiveness of using urine as a medicine. However, by the same token, there is no evidence that has been found supporting negative effects, either. But, it is important to note that the absence of evidence is not the evidence of absence, much like how we learned during Andrew’s lecture. Simply because studies have not been done proving that urine is bad for you does not necessarily give credit to the fact that it is healthy! If you recognize the fact that the urine expelled from the body is only water and excess nutrients, drink your own urine! It might not be proven that it is healthy for you, but the science behind the fact that urine is comprised of water and numerous minerals and nutrients has defineitly been proven. Do not drink your pee, however, if you have been ill or suffer from certain blood diseases and are taking serious medications; parts of those things will appear in your blood. Some people suggest that benefits arisen from practicing urine therapy have only arisen because of the placebo effect. Thats up for you to decide. So many legal drugs come from components of urine, so it can’t be all bad! If you can’t bring yourself to swallowing your pee (or using it for other medicinal purposes), relax! If need be, mix it with other drinks to start getting used to it first. The healthiest pee is the one expelled in the morning, so be sure to drink that one. When someone is peeing, especially in the morning, the middle portion has the most nutrients and minerals. Thus, pee a little bit in the toilet, then fill your cup, and then finish in the toilet. Bon appetit! Now the next question the scientific community must answer is whether you should eat your own…never mind! This entry was posted in Uncategorized on November 15, 2016 by Jeremy Perdomo. I never thought I would say this, but, if I was in a situation where I was stranded and had nothing to drink for days, I think I can now say that I would drink my own urine. I didn’t know that 95% percent of urine is water and that there are possibly many ways urine can be helpful for the human body. This blog is well-written with interesting references. It wasn’t easy to watch and listen to the video in one of your references because I kept gagging when thinking about drinking my own urine. While there aren’t any true scientific studies on the benefits of urine therapy, the Dr. A.H. Free reference that urine is more sterile than distilled water is the thought I will keep in the back of my mind should I ever be in the situation where I might need to drink it. Your writing style shows extreme interest and character which made it much more enjoyable to read. Since it is a disgusting topic, I did some light research to see if I could find anything that was not touched upon and came across something to ponder. 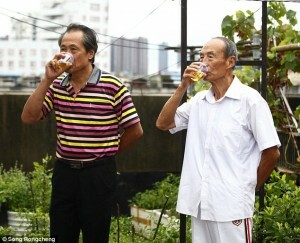 In this article, http://www.dailymail.co.uk/health/article-2471474/Drinking-urine-kept-young-says-91-year-old-man.html, a 91 year-old man claims drinking his own urine has caused him to look 10 years youngers. Check it out! what an interesting topic! I liked how you explained the topic and how organized it is. However, I think that the anecdote you provided does not help support the question “Should I Drink My Urine?”. Of course of one is starving he/she should drink his/her own urine without hesitation. It is also interesting to know about the placebo effect. I did not know about it until I read it in your post. I think that the placebo effect can make huge differences in studies results. For example, a small minority of people in my country -who age +50 – believe that when they get sick the only method that will help them get better is by getting injected. In fact, doctors sometimes use the placebo effect when they have patients who are convinced that injections always help them get better. They inject distilled water in the patients body and make them feel that they got the real medicine, which , in turn, will make their brain think that they got the actual medicine -the real treatment in the study- and thus get better. According to an article in WebMD- the link is provided in the end-, the placebo effect can make the body cause the same effects- or similar to- that the actual treatment causes. In addition, the article says that it is hard to distinguish the placebo effects from the real treatment effects in a study results. This could support the hypothesis that the results of the study were due to the placebo effects and that urine does not cause benefits. Overall, I am convinced that urine can have many benefits to the body, however, I am not ready to ‘drink’ urine becayse, as you mentioned in the post and as Andrew said in class “the absence of evidence is not the evidence of absence.” Thanks.